These seven hills is also called as Saptagri, represent the saptarishi . Hence the lord is also known as saptagirinivasa. It is a common practice that while climbing, at the foot of the hill people offer coconut and camphor and start climbing the steps they climb the steps without wearing the slippers or shoe as they think that the hill is the starting point of the temple and it is an insult to god to wear slippers and climb the hill. The vow taken by the devotee will be such that he will apply turmeric and vermilion (Haldi and Kumkum) to each steps, some will lit camphor on each and every step, some will lit incense sticks on each and every step. The journey starts from the starting point of the steps after praying by offering coconut and camphor they start climbing first visiting the two temples at the starting point which is called as srivaripadala mandam. The vow is such that the devotee doesn’t even have water till he reaches the end point of the hill. In between the devotees will be able see many huge statues of gods and small temples. The most interesting and eye watching is the deer park, where the devotees will forget the tiredness of the trekking of the steps at the glimpse of the deers . The offer all kinds of vegetables to deer voluntarily and rest under a huge banyan tree which is very old and the biggest one. On the way to Tirumala there is a place called Gaali Gopuram, where Divya Darshanam tokens are issued of the pedestrians. Pilgrims suffering from chronic illness like BP, Heart and Lung disease are advised to not to climb up the hills on the foot. Clean and well mainted toilets are available all along the foot of the path. Pilgrims are advised to go in groups and avoid going on foot between 10 pm to 4 am. One can see a huge idol of Lord Anjaneya at Anjanadri where the peetam (pedestal) is about 10 feet and the idol is about 30 feet. People after visiting Lord Aanjaneya will take some rest and refresh themselves and paya visit to temple of Lord Narasimha Swamy and continue their trekking. People even wonder about a the road connecting two hills which is like the shape of a cup. From here starts the “MokkalaMettu” which means steps of Knees where two versions goes here first one is that as the steps are so steep the devotees will keep their hands to support their knees and climb the second one says some devotee will climb the steps on their knees to appease the god. This is most difficult and most tiresome trekking in the climbing part. After trekking the steps the final will be the 3550th step while nearing the top most point of the steps the devotees will forget the stress and strain they have undergone and feel fully energetic. This feel is from most of the devotee who climb the hill. Some devotees even have vow that they climb each year. The place where pilgrims fulfil their vow of tonsure is called Kalyana Katta. More than 500 barbers, operating in three batches round the clock, are available at Kalyana Katta, to perform tonsure. To reduce the waiting time for tonsure during the peak season, over 100 additional barbers are engaged.The building is equipped with two big tonsure halls Tonsure done free of cost at Kalyana Katta. Blade is offered at the counter and Antiseptics are mixed with water and applied to the head before tonsuring to prevent skin-related and other diseases. Bathrooms, with geysers for hot water, are provided for the pilgrims who have their heads tonsured. A computerized system is in place to issue tokens for tonsure. There are 16 small Kalyana Kattas at important places in Tirumala which function from 6 am to 6 pm every day, to perform tonsure for pilgrims staying in cottages and guesthouses. The fee charged at these locations. Sapthagiri Satramulu and Ist N.C.
Lord Balaji temple in Tirumla, Tirupati is considered as the richest religious shrine in India. Tirumala is located at a elevation of 860m. This is one of the most important Hindu Pilgrimage centers of the world draws millions of pilgrims not only from India but different parts of the World. The Temple draws millions of pilgrims yearly and the busiest pilgrimage centre in the world. The main gopuram and the door are plated with gold. Lord Venkateshwara made Tirumala his abode five thousandyears ago. 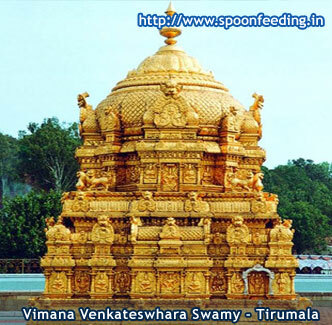 Even before lord Venkateshwara, Lord Varahaswami made Tirumala as his abode. Many devotees have continued to construct grand entrances on the ramparts of the temple over generations. Lord Srinivasa sought a gift of land measuring 100 square feet from Varahaswami, which he readily granted. With the permission of Lord Varahaswamy, Lord Venkateshwara stayed in 7 hills to grace his blessings. Lord Venkateshwara assured with Varaha Swamy with an agreement eed that he would be paid the first darshan, worship o and offerings by the dovotees. This tradition is still in vogue to this day. Lord Venkateshwara feels happy, only when the deveotees have their first darshan of Varahaswamy. One can see the one foot square copper plaque near the deity. It os said to be the written agreement deed presented by lord Venkateswara to Sri Varahaswamy. Words resembling the brahmi script are found on it. The height of the main entrance was periodically increased since 13th century. Its present height is fifty feet. This entrance has other names like Simhadwaram, Padivaakili, Periya Thiruvasal (in tamil). This temple complex is spread over 16.2 acres of land. The Shankanidhi and Padmanidhi are the two guardians of Navanidhi, the treasure of Lord Venkateshwara. When entered into the main sanctum sanctorum the chanting of “Om Namo vasudavaya”, “Om namo narayanaya” is heard vibrating. Near the temple you can see “Bangaru Bavi” –Golden well the well is also plated with gold and safeguarded. The Mahadwara and to its right, there is a high-rise mandapam (Porch). This is called Krishnadevaraya Mandapam or Pratima Mandapam. This mandapam is constructed in Vijayanagara architectural style. To the right side of this, one can find tall copper statues of the emperor Sri Krishnadevarayalu and his two consorts Tirumala Devi and Chinnadevi. These three statues placed in front of Lord Venkateswara express their devotion to him. 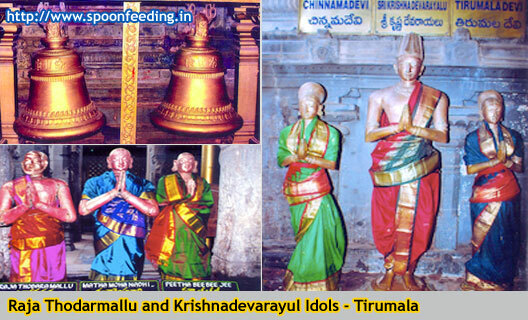 It is said that Sri Krishna Devaraya himself installed these statues. On 2nd January 1517 A.D. and from then onwards this mandapam has become famous as Krishnadevaraya mandapam. Their names are inscribed on the shoulder badges of these statues. Sri Krishnadevaraya has made seven pilgrimage trips to Tirumala between 1513 A.D. and 1521 A.D. He paid his first visit to the temple along with his two queens on 10th February 1513 A.D. and presented a crown made of navaratnas (nine varieties of gems), 25 plates made of silver to the Lord. The queens who came along with the king presented two golden bowls for ‘Pala aaragimpu’ (consumption of milk). Later on the king came alone and presented three crowns studded with precious stones and gems for the processional deities. He gifted five villages to the temple, including Thallapaka, to meet the expenditure on the daily offerings to the Lord. 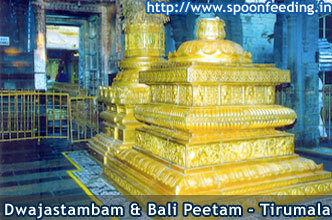 On his fourth visit on July 6th 1514 to the temple, he showered 30,000 gold coins on the deity. In 1515 he gifted a gems studded golden ‘makarathoranam’ (a festoon in the shape of a crocodile). He made a fifth visit to the temple on 2nd January 1517 to personally consecrate their own statues. He got the Ananda Nilayam gold plated with 30,000 gold coins in September 1518. He visited Tirumala once again in 1518. He made his eighth visit on February 17, 1521 and donated a golden cap along with a yellow garment studded with precious stones. By the left side of the main entrance or Mahadwaram there is a tall copper statue saluting with folded hands. This is the statue of Venkatapatirayalu, the king of Chandragiri, he was also a generous king who ruled Chandragiri during 1570s and donated many gifts to the deity. Let us now move forward by uttering ‘Jaya Jaya Ho Govinda’. Victory to the one who is the refuge of the three worlds! Victory to the one who is merciful to the devotees! Twelve feet to the north of ‘Srikrishnadevarayala mandapam’, there is a glass porch. Every day at 2 p.m. a service called dolotsavam is performed to the Lord in this glass porch. Devotees are permitted to participate in this paid seva. Just opposite to the glass porch, there is another high rise mandapam called Ranganayaka Mandapam, due to the Muslim invasions between 1320 and 1369 A.D., the idols of Lord Ranganadha of Srirangapatnam were shifted to Tirumala for safe keeping. Daily prayers and poojas were offered to him in this Mandapam. After the cessation of the Muslim invasions, these statues were once again shifted back to SriRangam. Yet this place is called Ranganayakula Mandapam to this day. 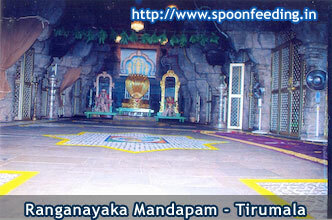 This mandapam is said to have been build by the king of Tirupathi, named Ranganadha Yadava Rayalu. 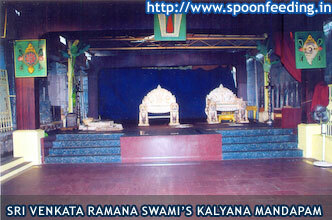 It is in this mandapam Kalyanothsvams were performed to the Lord. But, due to the increase in pilgrim rush, daily Kalyanothsvams are performed in Sampangi Pradakshinam. 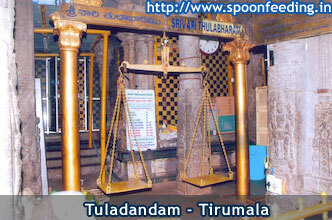 Ten feet to the south of the flag staff, there is another stone pillared pavilion called Tirumalaraya Mandapam. This was built by Saluvanarasimharayalu, the emperor of Vijayanagara, to express his gratitude to the Lord for his help in his victories. Every year, for five days, in the month of June and July, the Lord and his two consorts are placed on a rocking cradle in this mandapam. All couples begetting children with the blessings of the Lord, offer money in coins, silver, candy and camphor equivalent to the weight of their children as a vowed by them. Even the patients who are cured of their diseases express their gratitude similarly. This Tuladandam is arranged in front of the Ranganayaka Mandapam. At about hundred feet from the flagstaff, there are three copper statues of devotees, facing the Lord and saluting him with folded hands. One is that of Lalakhemaramu, the other is that of his mother Mata Mohana Devi and the third one is that of his wife Pita Bibi. Lala Khemarumu is a kshatriya known as Raja Todaramallu. He courageously protected Tirumala both from the invasions of Muslims and the British during the seventeenth century. This golden flag staff is located in the middle of a twenty-pillared square pavilion. To the east of the flag staff there is an altar and to the northeast, there is a granite stone called ‘Kshetrapalakasila’. This pavilion is said to have been constructed in the fifteenth century. During Brahmotsavams, a flag with Garuda’s imprint is hoisted on this flagstaff for extending an invitation to gods and goddesses (Yaksha, Kinnera and Gandharva), to attend this festival. Those wishing to take pooja material or other things into the sanctum, they have to circumambulate the dwajasthamba. Even the Lord is made to circumambulate the dwajasthamba whenever he is taken outside or inside the main temple. As this flagstaff is made up of wood, it has been changed from time to time. In the year 1982 a new flagstaff has been consecrated. Near the flagstaff is the Bali Peetam or altar. After offering food (Prasadam) to the Lord and other deities and after exiting through the silver gate, the Prasadam is kept on this altar. It is believed that this food offering is accepted by deities, the angles and the elemental forces. To the north east corner, under the flag staff porch, there is one and half feet high stone slab. This is called ‘Kshetrapalaka Sila’. It is said that this stone slab marched around the temple for providing security to the shrine at night. Even to this day, the priests touch this stone slab with key bunch after closing one before opening the temple. Earlier all wedding festivities of the Lord were celebrated at the pavilion in the ‘Vimana Pradakshinam’. With the increase in the number of the devotees, these festivities were held for sometime in Ranganayaka Mandapam. At present a large zinc sheet porch is erected for this purpose as the space in Ranganayaka Mandapam is found in adequate. Let us salute the newly wedded Lord and his consorts. We all will worship them at Tirumala. It is the Vaikuntam in Kaliyuga. As per the legend, Viraja, a sacred river of Vaikuntam flows below the lotus feet of the Lord. The well of water in the temple complex is believed to be a part of that holy river. This well is located in front of the Ugranam or store house. Idols are sculpted on the stones used for the inner walls of this well. Hence this well is called ‘toy well’ or ‘bommala bavi’. As of now a four feet high brick parapet wall is erected over this well. This kitchen is referred to as ‘Padi potu’. Sweet and savories like laddoo, vada, appam, dosa, poli, sukhiya, jilebi, etc which are offered to the Lord are prepared here in large quantity. To the east of this kitchen is the ‘flower chamber’. The Lord being a lover of flowers, wishes to be decorated with them. All the flowers raised on the seven hills are only meant for the Lord of the seven hills. Others are forbidden from using flowers while on the hills. This is the tradition of the place and shrine. This ‘flower chamber’ now stands shifted to ‘Vimana Pradakshinam’. Every morning and evening the Jiyyangas collects the flower garlands prepared in the flower chamber and carries them over his head to the Lord after circumambulating round the flag staff with trumpets blowing and umbrellas shading and presents them to the Lord’s Sanctum for performing the various rituals and poojas. In the Vimana Pradakshina pathway and at a distance of nine feet to the south of the silver door, is the Varadarajaswami temple. The idol is 5 feet high with a single pagoda over the shrine. Devotes have to go round this temple on their way to the Lord’s Darshan. When this idol was installed is not known. Victory to Varadaraja who is ever merciful and grants boon to the devotees! Let us now move to have darshan of the Lord in the Ananda Nilayam and later learn about the small shrines in the Vimana Pradakshina path way in the precincts of the temple complex. The most important entrance for going into the sanctum sanctorum is this golden gate. From this entrance we can see the Lord directly. Since ages, Lord’s very special ‘Suprabhata Seva’ has been performed at the pre dawn hour i.e. 3 A.M. every day. Here this stone frame of the entrance and the statues of Jaya Vijaya on either side of the entrance are gold plated and hence this name. At night these doors are closed methodically in a preconceived fashion. There are three bolts for these doors. The upper and the lower door bolts are locked by the authorities, while the middle one is locked by the priests. The pavilion that you notice after crossing the golden door is known as ‘Snapana Mandapam’. Every day after Thomala Seva, the idol of Koluvu Srinivasa murthy is brought here and placed on the golden throne and his court is held. During this court, almanc is recited; the affairs of the day, the details of income and expenditure of the previous day are reverentially presented to the Lord. The golden throne that is used during this court is stored in the adjacent grilled chamber. There are two rooms on either side of the golden door. In the right side room, the Hundi collections are kept. In the left side room, the Lord’s jewels i.e. the crown, the conch, the chakra, necklaces made of diamonds, gems, rubies, emeralds, sapphires, topazes etc are kept. The service of adorning the Lord with these ornaments is called ‘Samarpana’. The Samarpana is classified into three types: Sada Samarpana, Visesha Samarpana and Antique Jewellery. Sada Samarpana:- These are the ornaments which are worn by the Lord every day. They are kept in the charge of the chief priest. Their value is said to be around ten million rupees. Vishesha Samarpana:- These are the special ornaments which adorn the Lord during festivals and during the visit of VIPs like the president of India and the Prime minister to the shrine. The Lord’s diamond and gem studded crown, Sankhu (conch) and Chakra (disc) are kept in the charge of a special officer known as ‘Parupathyadaru’. These are valued at 20 million plus rupees. Antique Jewellery:- They adorn the Lord during Brahmotsavams. They comprise antique jewellery gifted by the king and queen of Gadwal. More than their monetary value, they are of immense historical importance. These ornaments are kept in the safe custody of T.T.D. treasury. Look! That’s the Sanctum of the Lord of the universe. Have a good look at the glorious, celestial and heavenly form of the Lord. With unbated eyelids In the middle of the Sanctum, Lord Venkateswara’s ‘Swayambhu’ idol fully clad in jewellery made of precious diamonds, gems, emeralds, rubies etc. is seated on the pedestal called ‘Brahmasthana’. In other words, Sri Mahavishnu along with Mahalakshmi on his chest has descended from ‘Vaikunta’ on the Tirumala Hills as the first ‘Swayambhu’ idol. The beauty of this ancient idol is beyond the reach of any sculptor. As per Agama Sastra, 36 kinds of precautions are taken for carving a perfect idol. The idol of the Lord is different from the sculptural theory as it is self made ‘ Swayambhu’. This beautiful idol has four ever brilliant hands in different postures. In the right upper hand there is ‘Sudarsana Chakra’ (disc) and in the left upper hand there is a conch, while the lower right hand is known as ‘Varada Hastha’ and the lower left hand is known as ‘Kati Hastham’. The lower part of the waist appears to be tilted to the left while the knees appear to bent a little. This glorious posture of the Lord is very unique, attractive and decent. While the Lord is being decorated with flowers and ornaments, the priests have felt the soft and supple body of the Lord though it is a granite idol. It is also said that the Lord perspires after ‘Abhishekam’ and sweat is seen on the idol. For the priests serving the Lord in the Sanctum, the idol appears to be a living figure and not one made of granite. The main idol of the lord is very ancient one and it is proved not only by Rishis and Yogis but also by scientists and archaeologists. The Silathoranam in Tirumala is said to be 2500 million years old. The well beside the main kitchen is known as ‘Bangaru bavi’. The water from this well is used for Abhishekam, archana and cooking food for the Lord. In the earlier era water from this well was channeled directly to the tub in the kitchen through a fifteen feet high canal. This technique used here is similar to that used in pumping water at Hampi town during the reign of Vijayanagara kings. Even twenty years ago water was being pumped into the kitchen through this canal. But now a days due to heavy rush of pilgrims and due to increase in quantum of preparation of Prasadams, water is being pumped by a motor. Lord Venkateswara ingrained on Ananda Nilaya Vimanam is said to be as powerful and sacred as the main deity in the sanctum. Even if one fails to have the darshan of the Lord, he could have a glimpse of Vimana Venkateswara and derive the same benefits usually associated with the darshan of the Lord in the Sanctum. Nowadays due to increase in pilgrim rush, the devotees have the darshan of ‘Vimana Venkateswara’ only after having the darshan of the Lord in the Sanctum. After having the darshan of the Lord, the devotees deposit their offerings to the Lord in this Hundi. This hundi is sealed with sealing wax not only by the TTD officials but also by the Jiyyars. While opening this hundi, officials verify whether the seals are tampered or not. It is believed that a Sri Chakra is placed under this hundi and hence the deity receives lot of wealth in the form of offerings. Sri Ramanadha Ghanapati, a veda pundit of TTD has said that when he was still a student of Vedas seventy years ago, ground under hundi was dug to raise the ground level of the temple. It was then that the Sri Chakra Yantram was found. The temple complex was modified many times for creating easy passage to the devotees. But the hundi was never shifted from this place. The Lord has blessed us with this beautiful life, a family, wealth and everything. Let us not hesitate to sacrifice a part of our wealth which the Lord has given us. Each paise we offer to the Lord is spent for a good cause. Let us all deposit our offerings in the Hundi and have the darshan of golden Varalakshmi. Sri Bedi Anajeya Swamy Temple is located on Sannidhi street, opposite the main temple. (In the Vaishnavite tradition it is customary to have either Garuda or Anjaneya opposite the main temple). Here the Anjaneya is in folded hands and tied with Bedi (chains). Rarity of the temple is that we find Lord Hanuman in a standing pose with folded hands tied with a chain. As per an anecdote it is believed and said that Lord Hanuman as a child (Bala Hanuman) was highly mischievous and disturbing the sages on the hill while performing penance. In order to control Bala Hanuman Lord Rama tied him with iron chain which is known as Bedi (hand-cuffs) in Telugu language. People coming to Tirumala express their experience with the monkey menace, to avoid this every devotee will visit and pay their respects to Anjaneya Swamy. In order to prevent Anjaneya's flight his mother Anjana Devi residing near Akasa Ganga at Anjanadri of Sapthagiri (7 Hills) prevailed upon her son and tied the celestial bedi (Hand-cuffs) to his hands with the aid of several monkeys living there, so as to make Anjaneya stay in devotion in front of the Lord's temple to fulfill her desire. 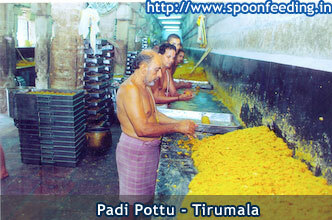 Papavinasanam is one of the sacred theertham located in Tirumala. According to Sri Venkatachala Puranam, A HOLY BATH in this theertham will purify the sins of the devoties and bless with peace, prosperity and progress. Sunday combined with shukla paksha sapthami in the month of aswayuja or dwadasi with uttarabhadra star is an auspicioy day. The prominence ot this theertham was also mentioned in skanda puranam. The authorised purohiths of TTD purohitha sangam of tiurumala are performing daily pujas, Sankalpa etc. In the intrest of visiting pilgrims as per the TTD approoved rates. Hear, the dieties of godess Ganga and god Sri Anjaneya Swamy are established. 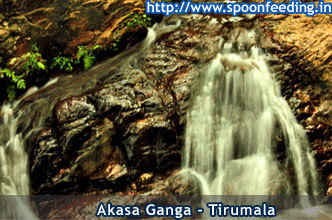 Akasaganga Theertham in Tirumala holds fabulous legends about its origin. One of the waterfalls found in the near surroundings of the main temple, this sacred torrent gains predominance over the others since all the rituals are conducted with the holy waters of this theertha. It situates just five kilometers away from the main temple and traditionally the Tirumala Nambi family is allowed to take water from the waterfall to the temple. The geological stone arch is one among the world’s three naturally formed arches of stone and is dated back to 150 crore years from now, probably to the days of evolution of life on earth. This natural beauty that has been a silent witness to the ages stands at 10 feet height and 25 feet in width. The rocks around forming the natural arch are dated to be around 250 crore years old. Sila translates to Stone and Thoranam translates to Arch. This beautiful place is on the Tirumala hill at a height of 2800 feet above sea level. One can make a walk to this place or hire a local taxi on the hill top of Tirumala. There is a small birds enclosure next to this place. Stop over to visit the birds. The naturally settings of the seven hills atop make it a great treat for the eyes. 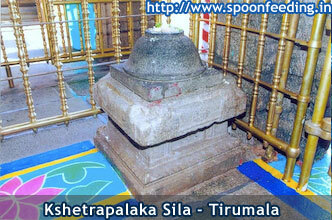 The Sila Thoranam is most visited by Tourists and Pilgrims alike, all throughout the year. It should be on ones must visit list if someone is making a trip to India as this is one of the two left naturally formed arches in the world and also Tirumala a abode to this place also a congregation of a rich Hindu culture that one can see it evident as they come here to pay their respects to the residing deity Lord Venkateshwara. The Chakra theertham houses a temple with Swayambu lingam. Like all other sacred water bodies in Tirupati, this theertham also holds fabulous legends. It is popularly believed that lord Brahama selected this spot as a perfect location for observing repentance. And to cleanse the place lord Vishnu plunge his Sudarsana Chakram and the place where the Sudarsana Chakram fell on became a deep pit, which is popularly called as Chakra Theertham. It is believed that doing penance here would fetch the devotee the lotus feet of the Lord and so this has been turned as the popular spot in Tirupati. A way ahead of Sila Thoranam at Tirumala, the abode of Lord Venkateshwara a human incarnation of Lord Vishnu is a location that has been famous to be the first foot step of the lord which he set on this piece of earth. The foot marks are visible and the direction of the feet is pointing towards the today’s new sanctum sanctorum of the Lord, the main temple of Balaji (Lord Venkateshwara). This beautiful place is said to be the highest hill top among the seven hills with an excellent bird view it offers of the city and surroundings of Tirumala, definitely breathtaking from this point. One has to take paved stairs to reach this place as there is no other alternative. There is a tree nearby where people tie threads with a wish to get fulfilled, the tree is said to fulfill the boons. Some people leave their visiting cards of business for growth and prosperity. Lot of devotee’s who visit Tirumala, comedown to visit the lord’s feet set in the mesmerizing natural settings of the nature and in short, a dip in versatile India and its roots. Here you can find giant squiril also known as Malabar squiril. After Visiting the sacred Tirumala and its surrounding temples we now move on to climb down the hill and visit the nearby local temples. The Holy Temple of Kapila Theertham (Springs) is the only temple dedicated to Lord Siva in over a 50 mile radius of the holy temple cities of Tirupati and Tirumala that abound with temples of the Vaishnavait Deity Vishnu. This temple is located one and half miles from Tirupati, Chittoor Dist. In famous Kapila Theertham Temple Presiding Deity is Lord Siva. Here Lord Siva is called as Kapileswara. 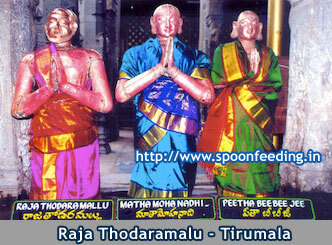 It is one of the famous 108 Sacred Theerthas on Tirumala Hills. This huge temple stands at the entrance to a mountain cave in one of the steep and vertical faces at the foot of the amazing hills of Tirumala, where the waters of the mountain stream Paapa Vinasanam fall as a huge waterfall. One and half miles from Tirupati at the mountain foot of Sheshadri hill there is a temple where Kapileswara abides in the form of Linga (Phallus) called Kapila Teertham. The Sivalingam is made of brass in one of the shrines at Kapila Teertham. A huge stone statue of a seated bull Nandhi, Lord's Siva's steed, greets devotees and passersby at the entrance to the temple. This temple is dedicated to Sri Govindaraja Swamy. brother of Lord Venkateswara. Govindaraja Swami Temple in Tirupati. Govindaraja Swami Temple has two main shrines dedicated to Lord Vishnu and Lord Krishna. 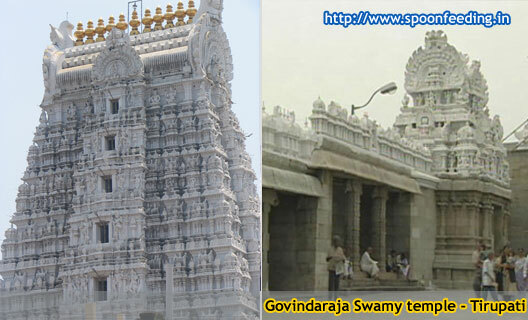 Govindaraja Swami Temple has a remarkable outer gopura and an inner gopura. The inner gopuram is the earliest one, dating between the 14th and 15th centuries and has carvings that depict scenes from Ramayana and Lord Krishna's life. One of the very important temples in Tirupati , Sri Govindarajaswami Temple was consecrated by Saint Ramanujacharya in 1130 AD. 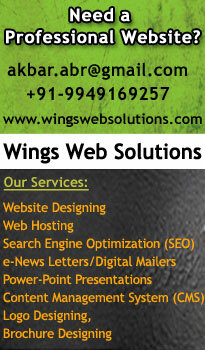 It is located in the heart of the Tirupati. The Main Shrines :Govindaraja Swamy Temple, Andhra PradeshIn this temple there are two main shrines. In the northern shrine is 'Sri Govindaraja', who is Lord Vishnu lying on 'Ananta'. He is considered to be Lord Venkateswara's brother. The other main shrine has Deities of 'Sri Parthasarathi' (Krishna as the charioteer of Arjuna), 'Rukmini' and 'Satyabhama' (Krishna's wives). Few parts of the inner shrine date back to the 9th and 10th centuries. The original temple had Sri Parthasarathi on the main altar. 'Sri Ramanuja' added the Sri Govindaraja deity around 1130. The Entrance :It has an imposing seven-storey 'Gopuram' built in 1628, which can be seen from a distance. To the left side of the entrance first Gopuram (gate) of the temple dedicated to Lakshmi is found. She is seated on a lotus in her four-armed form, holding a lotus in each of her upper hands, while her other two hands are in poses of 'Abhaya', fearlessness, and 'Varada', benediction. Another nearby shrine is dedicated to Sri Ramanuja and on the left of the second entrance is a 'Kurma' Deity, Lord Vishnu as a tortoise. There are carvings depicting the pastimes of the Ramayana and Lord Krishna's pastimes on the second gopuram.The annual float festival is also celebrated every year. 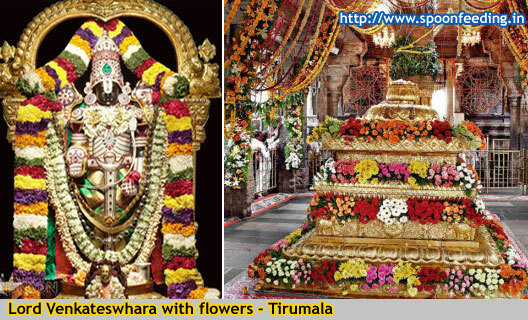 The festivals and functions are similar to those conducted in the Sri Venkateswara temple. This temple is dedicated to Sri Rama is situated within a distance of about 1 kilometer from the Tirupati Railway station. Opposite to this temple there is a Anjaneya swamy temple called as Bedi Anjaneya swamy. Inside the temple there is temple of Vishwaksena and Alwar. Sri Rama navami is celebrated here where the utsavam starts from Ugadi to Rama navami. 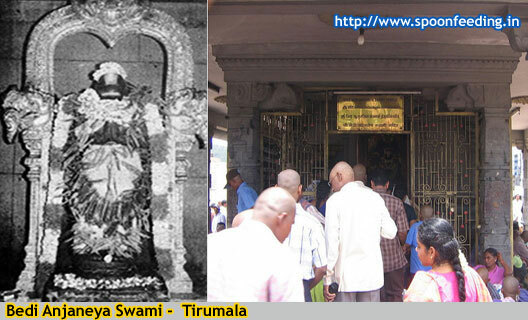 The Temple was built to commemorate the visit of Sri Rama,Lakshmana and Sita to Tirupati, while returning from Lanka. According to inscriptions, the temple was built by one Narshima Mudalayar for the benefit of Saluva Narasahima in A.D 1480. Tiruchanoor, the abode of Goddess Sri Padmavathi Devi, is one of the highly venerated places in the South, located five kms. from Tirupati, the temple dedicated to Sri Padmavathi Devi, the consort of Lord Venkateswara, attracts thousands of devout pilgrims every day. The Goddess, also known as Alamelu Manga, is the inexhaustible source of compassion and love. SriKalahasti temple is located 36 km away from Tirupathi in Chittoor district of Andhra Pradhesh, India. The inner temple is constructed around 5th century and the outer temple was constructed in the 12th Century. The temple is called as Dakshina Kailasam located on the banks of the river Swarnamukhi. The architecture of Srikalahasti Temple-Chitoor is extraordinary, it has three massive Gopurams which are breathtaking. Another striking feature of the temple is its huge Mantapam with hundred pillars. Thousands of pilgrims from all over India visit the temple to have darshan of the almighty Sri Kalahasteeswara God and Goddesses Sri Gnanaprasunambika Devi. The Shiva Linga here is said to be vayu linga (air linga) because the priest feel that the shiva linga breathes and they can feel the senses. To note it the priest lit the deepam which flickers heavily in the Garbha Gruha (inside sanctum sanatorium). The Linga, which is in the shape of an elephant trunk, with tusks on each side and a figure of a spider at the bottom, is untouched by human hands, even by the priests. Abhishekam (anointing the Lord) is done to the ‘Utsava Murthi’ by pouring a mixture of water, milk, camphor and Panchamrita. Even sandal paste, flowers and sacred threads are offered to the utsava murthi and not to the main idol. There are some legends and myths associated with the temple of which two are most popular. One of them is in “Sri Kalahasti Satakam”, describing the origin of the name of the temple and the other, in the Tamil hagiology, describing the association of the original jungle temple where Kannappa, an ardent devotee of Lord Shiva worshipped. The temple is also a famous parihara sthalam for Rahu and Kethu doshams. Special parihara pujas are performed here for Kalasarpa dosham and other afflictions associated with Rahu and Ketu. If the People who have Rahu Kethu Doshas and Sarpa Doshas, the unmarried and couples without children perform the most effective Rahu - Kethu Sarpa Dosha Nivarana Puja in this Temple. Thousands of Devotees from the country and abroad perform this puja and fulfill their vows again and again after receiving good results. Rahu - Kethu (Kala Sarpa Dosha) Nivarana Puja can be performed daily between 6:30 A.M and 9:00 P.M. While you can perform pooja at any time, performing pooja during rahu kalam is considered to be auspicious. Sunday and Tuesday are the best days to perform pooja as Sunday and Tuesday are the days considered to be for Rahu and Kethu. (The Devastanam will arrange all Puja Materials). Kanipakam is a village and pilgrimage center located in Chittore district of Andhra Pradesh. This place is famous for the Varasiddhi Vinayaka Temple, which has an idol that grows in size. The most important thing here to note is that water flows touching the idol in the main sanctum sanatorium, upon request the priest will give the water which flows touching the idol. Many believe that it has lot of medicinal qualities. At present, we can see the knees and the abdomen of the idol. One of the devotees had offered a Kavacham (armour) to the Lord fifty years ago and today it is out of size and doesn't fit the idol. The holy water from the well is offered to the devotees as theertham. At a distance of 62 kms from Tirupati, 12 kms from Chittoor and 560 Kms from Hyderabad, this village lies close to Karnataka & Tamil Nadu border on the banks of Bahuda River. Kani means wetland and Pakam means flow of water into the wetland. It was constructed in the 11th century CE by the Chola king Kulothunga Chola I and was expanded further in 1336 by Vijayanagara Kings. The striking feature of the idol is that it is still growing in size. According to a legend, there were three handicapped brothers, Dumb, Deaf and Blind. They were farmers and used to drawn water for farming from a well nearby. One day the well got dried and they could no longer continue cultivation. One of them got into the well and started digging it up. He was shocked to see blood coming out of the well. Within in a few seconds the entire water turned red. All the three became normal getting rid of their deformities. As soon as the villagers came to know about this miracle, they thronged to the well and tried to deepen the well further. They found swayambhu idol (the self-manifested) of Lord Vinayaka emerged from the swirling waters. At a distance of 15 Kms from Kanipakam, Ardhagiri Veeranjaneya Temple is located on Ardhagiri Hill near Aragonda in Tavanam Palle mandal of Chittore district. When Lord Hanuman found Sanjeevani to save Lakshmana during the war with Ravana, he carried the entire Hill as he could not recognize the Sanjeevani plant. It is believed that, a part of the Hill (carried by Hanuman) was dropped at this place and called as Ardhagiri (half hill). It is believed that consuming water of Pushkarini at this temple can get you free from all diseases. Special poojas are performed here on every full moon day. Hanuman Jayanthi is also celebrated in a grand manner.